Bloody Mary Mix – I Love It Spicy! 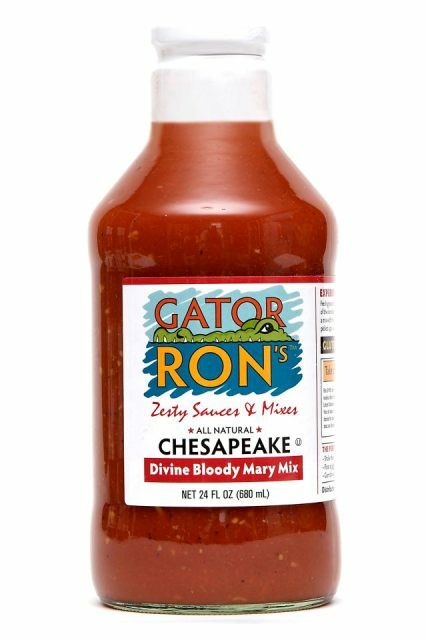 We are back with our 3rd of 4 reviews for Gator Ron’s Zesty Sauces & Mixes. If you have not followed these reviews thus far, the heartfelt story behind the company is worth reading about. “Gator” Ron Griffith passed away back in 2011 from his fight with Amyotrophic Lateral Sclerosis (ALS) or commonly known as Lou Gehrig’s Disease. Constance, Ron’s wife took up the baton and carried out Gator Ron’s dream and their company was established. With a lasting legacy, a percentage of all sales of Gator Ron’s Zesty Sauces & Mixes will be donated to the Robert Packard Center for ALS Research at Johns Hopkins. By all accounts, so far after 3 reviews, it looks like Gator Ron’s has some goods worth trying. Give them a try and at the same time you will be helping in the fight to find the cure for ALS. I have been doing reviews for 5 plus years now, and every now and then you run across a “character” that you know will be someone you will want to meet sometime in the future. You get that feeling from your first contact that you are dealing with a nice guy with a good sense of humor. Enter The Murph, Stephen “The Murph” Murphy. A Long Islander much like myself, a Met fan much like myself, so we all ready had much in common to talk about through our email exchanges. I recognized his bottles from Peppers of Rehoboth, DE, but I had also seen the bottle at a local Italian Market called Iavarone in the town I grew up in- Wantagh, NY. I go to the grocery store all the time, and every single time I see The Murph Famous Bloody Mary Mix I think of my beloved NY Mets. The Mets’ TV and radio announcers I grew up with as a kid were Ralph Kiner and Bob Murphy. While the name The Murph doesn’t necessarily make me think of Bob Murphy, the picture of Stephen on the bottle reminds of a young Ralph Kiner. I told him this and he got a chuckle out of it. We are back with another Bloody Mary review for Demitri’s. Sorry we did not deliver as promised with a 2 week intermission since the last review. Yet, I think with the holidays fast approaching, what better to celebrate or give a gift than one of the best Bloody Mary mixes we have ever reviewed. You will see how much Fiber Joe and Dale loved this by their reviews as they went way past the Bloody Mary drink to sample this stuff using the recipes provided. Derrick didn’t care for this particular seasoning, but that is why we do multiple person reviews folks, to get a lot of feedback because everyone has different tastes. Please check the reviews out if you are a Bloody Mary fan, you will not be disappointed. Does the idea of extra horseradish excite you my Chilehead Brothers and Sisters? What about a good tasting Bloody Mary mix? How about the combination of the two? A Bloody Mary with that extra horsey kick you always wanted in your tomatoey potion. In comes Demitri with the answer to your prayers. Is it a success like their Classic Recipe we unveiled last week? Our videos will unfold the answer to that question. Check out the 1st review HERE and see what the fuss is all about.